Here you set up the product title and a description. Thank You Page – This is where your customer will be taken directly after purchase. You can set this to be an upsell or order confirmation page. Logout Redirect – Where your customer is taken to when they log out. You can send them to another offer if you wish. Next we select the membership type. These are the payment processors you can choose to accept for a particular product. This is used for the affiliate system to set the length of time any payments thresholds are held before full payout. This is to let you account for refunds so you are not out of pocket paying affiliates if their referrals request a refund. You can create a bundle of products. If you choose this option you will be able to select any number of other products and your customer will be given access to these at the same time. This is useful if you have bonus products you would like to add to your main offer. You can set the default signup role for both the Member and the affiliate here if you wish for them to have something other than the default WordPress Subscriber role. Caution: This could pose a security risk if you were to set your Members or Affiliates with Admin role, so use this wisely. This is what will happen when a Non-Member or an Expired Member tries to visit a page with members only content. The default setting will display a message on any page a non member visits. There are a number of other options for both Non-Member and Expired Members which include setting a redirect and also showing a custom message. You can view the full tutorial for ‘Non Members and Expired Members’ here. Here is where you can enable the Affiliate System. You will find options for the default Affiliate Commission percentage and the cookie duration. You can also choose if to hold the affiliate commissions until the end of the Money Back Guarantee period. If this is enabled your affiliates will not be able to request a withdrawal until this period has expired. Here you can choose one of the built in integrations. If you have one of the Fast Flow Autoresponder add-ons installed you will see an extra option appear in the list. You can also choose to subscribe the member to the built in Autoresponder system. Here you can change the default Hidden Content message which is displayed to members when you use the ‘partially hidden content’ short-code. This message can be formatted just like any other WordPress post and can contain images, links and buttons of you wish. This is where you set the emails associated with each product. Each product can have a unique a sender name and email address. 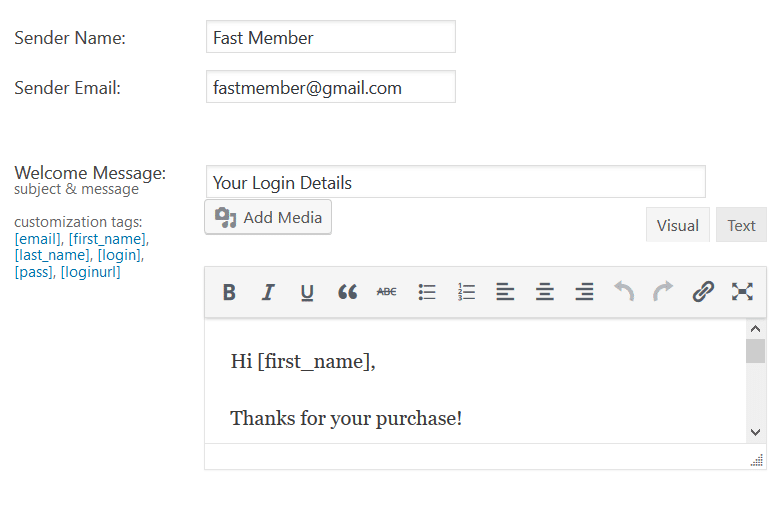 You can also customise the Welcome Email message with various tags. This will be sent immediately after purchase of a product, giving the new member the required access details for the membership site. If they are already exist as a member within WordPress the password will be hidden and a note to login with their existing password or request a password reset will be added to the message. If ‘Send Email to Verify’ is checked within the Free Product there will be an additional email notification for the confirmation message. Within this you can add the tags for user details plus the site url and a confirmation url which will be generated unique for each subscriber. Once this is clicked they will be confirmed and logged into the site. You can view the full tutorial on the Free Member verification process here. The first is the Affiliate Registration email. If left blank the global Affiliate Registration email from the Fast Member settings page will be used. If you wish to create a product specific Affiliate registration/welcome email then you can enter the details here. The next email is the Affiliate Sale notification. This will be sent to your affiliates each time a sale is made. You will see a preconfigured message already added which you can change as needed with extra customisation tags to enter the customer name and email if required. Finally at the bottom of the Email Verification page you can send a test email for each of the messages. The final tab of the Product Settings contains a section called integrations. This section will not appear until when a new product until it is saved. Once saved you will see the options for the built in 3rd Party Integrations, plus any Fast Flow plugin integrations which you may have installed. You can view a more detailed tutorial on the Integrations here.